Right in front of you, there is an interactive coloring app and it is’t a simple one! This coloring book can help you get rid of stress and express your artistic tendencies. Use a variety of color palettes to breathe new life into dull and colorless pics! It’s up to you what to choose as there are many kinds of images available for you to color. Choose among children's drawings and world-famous art works and coloring them in your own unique style! Choose colors, blend the mandala palette and create new stunning shades to turn ordinary illustrations into a masterpieces! ???? Color pictures of any kind: flowers, animals, landscapes, patterns, mosaics color by number and many more! ???? Create color shades by mixing the coloring pictures palette! ???? User-friendly mandala interface: your finger is the main tool here – a drawing brush pen! ???? 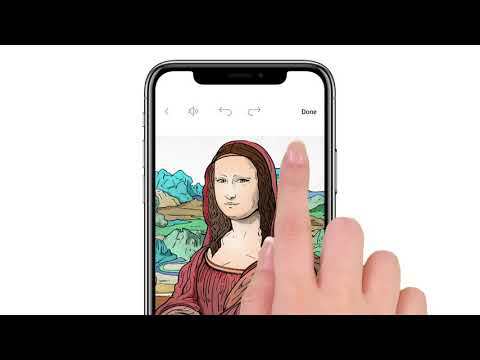 Change the familiar elements of famous masterpieces, turning them into your own works of art! ???? Share your paintings with your friends through social networks! Add bright colours to your life! ???? Create a truly art colorful mood! Fill each pic with bright colors and new artistic features, making the original color by number image absolutely unique! Fulfill your creative abilities, acting as a pixel creator! Also, do not forget to share your works through social networks, pleasing friends and family. Express your emotions with color! ???? Coloring with interactive features! You can breathe life into any of the colorbook pictures! Adding colors to any coloring pages image you like, you enjoy stunning visual effects. Here, the motionless butterfly suddenly comes to life and flaps its wings, and the woman winks at you from the screen of your phone or tablet. Create life by drawing with different colours! ???? Painting for all ages! This coloring book perfectly suits both children and adults. The color therapy develops the motor skills and allows you to improve your artistic abilities. An unlimited range of colors and your imagination are at your coloration disposal! - With Colorist Plus you are notified about all the updates and have unlimited access to the full catalog of coloring games pics. - You will have access to all the coloring pictures available in the app, and also receive notifications about new features of the coloring game. - Subscription price is the following: $7.99/week, $14.99/month and $79.99/year. The price may vary depending on Google Play currency rate in your country. - Also you can unlock new coloring pages with art stars — in-game currency. You can earn stars for completed tasks, for viewing ads or buy them for real money. The price for 100 stars is $ 1.99, for 300 stars - $ 4.99. Dive into the whirlpool of bright colors!